For those who wish to create their own custom Tanabe exhaust system, the universal TUNER MEDALION is now offered. 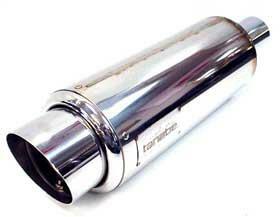 Featuring inlet sizes ranging from 60-80mm, Tuner Medalion is perfect for any custom NA or Turbo exhaust application. Ideal for fabrication of a full catback, simple axle-back exhaust systems, or for vehicles that do not readily have a catback exhaust system available for them. Tuner Medalion is available in RACING or HYPER trim. Tuner Medalion Racing is a rebuildable unit that comes with a removable inner silencer. For the best custom exhaust system.